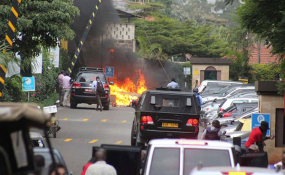 There has been a fresh twist to the motive of the Al-Shabaab attack on Nairobi's DusitD2 hotel which so far has claimed over 20 people with the US President Donald Trump being in the mix. The statement reads in part "Nairobi attack was a response to the witless remarks of President Trump and his declaration of Jerusalem as the capital of Israel and the systematic prosecution of Muslims in Palestine. It added "Al-Quds will never be Judaized". Both the Palestinians and the Israelis claim Jerusalem as their capital, and the city contains sites sacred to both Jews and Muslims. Though Israel's parliament and the prime minister's home are in Jerusalem, they sit in West Jerusalem, on the side of the city Israel has controlled since 1949. Israel captured East Jerusalem in 1967 and annexed that half of the city.